Max Vadnais/The Aspen TimesChris Davenport, left, and Neal Beidleman speak on Wednesday during the Aspen Business Luncheon at the Wheeler Opera House. Beidleman described visiting the memorial of Scott Fischer, a guide who was killed in an ill-fated expedition on Mount Everest in 1996. Beidleman returned to the mountain for the first time this year since the 1996 ordeal. ASPEN – Neal Beidleman found solace at 26,400 feet in elevation on Mount Everest last May after spending 15 years replaying events in his mind from a harrowing ordeal on the same peak. It’s not like he was haunted by demons from 1996 when five climbers in his group and others were killed in one day and a total of 10 were killed during the short climbing season, he said. Instead, he needed to revisit crucial places on the world’s highest peak on his first trip back in 15 years to help inch toward closure. 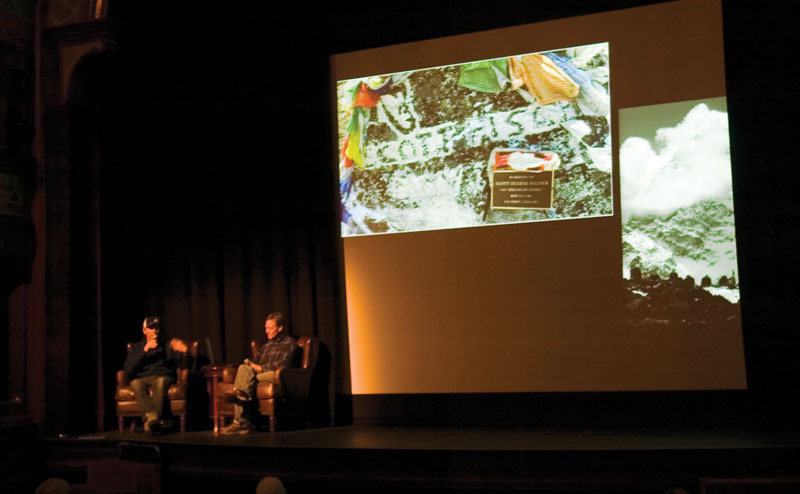 Beidleman, an Aspen native, recounted his May 1996 and May 2011 expeditions to Mount Everest on Tuesday at the Wheeler Opera House in a discussion with Chris Davenport, another Aspen adventurer who accompanied Beidleman this year. Their discussion was part of the Aspen Business Luncheon’s regular program to present issues of community interest. The first opportunity came at a point on the mountain where memorials have been erected to many of the climbers who have lost their lives over the decades on Everest. Beidleman found the memorial to Scott Fischer, his friend and head guide of the 1996 Mountain Madness expedition. Fischer and Beidleman became friends while crossing paths in the Himalayas in the 1990s. Fischer invited Beidleman to be a guide on his commercial expedition when such trips on Everest were in their infancy. Fischer lost his life when a blinding blizzard blitzed climbing groups on May 11, 1996 while they descended the mountain. Beidleman had recovered the top to Fischer’s pack in ’96 and taken it back to his home in Aspen. It sat in his garage for 15 years. He took it back to Everest in May and attached the hood to prayer flags at Fischer’s memorial. “That probably is what put me over the edge,” Beidleman said, referring to a series of emotional experiences as their 2011 climb up Everest progressed and they passed places where death struck or was narrowly averted by his group. Davenport said he and Beidleman left their oxygen bottles in their tents and walked around for a couple of hours. “It was one of the highlights for me of the trip because you’re kind of like beach combing, you’re finding all these little artifacts going back to the 1960s,” Davenport said. They finally found the spot where Beidleman and seven of his colleagues huddled together in 1996, blinded by a nighttime blizzard. Beidleman had decided the group had to hunker down after coming off the summit rather than continuing the search for their tents. They were about 300 yards from the camp but a world away in the whiteout. He feared someone would fall behind and get lost in the whiteout, or that the entire group would plummet to their deaths on the sheer drops that surrounded the platform of frozen ground. Aspen resident Tim Madsen and former Aspenite Charlotte Fox were on the 1996 climb and among those who huddled. They were among the survivors. Half the group was able to stumble into camp after the storm eased; some of the others were rescued. Davenport and Beidleman spent at least 90 minutes at the spot, discussing the events of 1996 and Beidleman’s feelings about what happened. It was all captured on video for a documentary the men are working on. Beidleman said revisiting the spot was “surreal,” not only because they talked through the ordeal at the same physical place but also because they did it in the same frame of mind – without oxygen. Beidleman, who recounted the events in a calm and collected delivery for roughly 90 minutes, said functioning at that high of elevation without supplementary oxygen helped put the events of 1996 in perspective. That was a not-so-subtle reference to the tsunami of analyses that the commercial expeditions of May 1996 received in the media. Jon Krakauer’s best-selling book, “Into Thin Air,” provided a compelling firsthand account of the 1996 climb and painstakingly pieces together events. Some of the analyses criticized Russian climber Anatoli Boukreev, another guide in Mountain Madness. Beidleman has avoided assigning any blame for the deaths but acknowledged mistakes were made on the expedition, including Boukreev’s decision to climb without oxygen. That limited his ability to assist the Mountain Madness clients because he had to leave the summit before the group, Beidleman said. Davenport and Beidleman’s presentation also focused on the triumph of this year’s expedition. They summited along with Aspenite Ephi Gildor and Bill Allen. One of the biggest changes over the 15 years, Beidleman said, is the responsibilities of the guides. All guide companies now contribute money to a pool to pay sherpa to attend to fixed ropes, ladders and other necessities critical to the expeditions. That frees up the guides to focus on getting their clients acclimated and potentially speeds the process. Beidleman wrote a firsthand account of his two climbs for the current edition of Aspen Peak magazine.